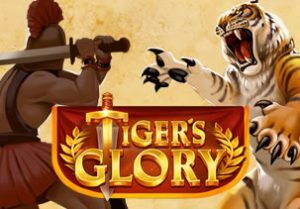 Sadly not related to Tiger Woods’ recent golfing renaissance, Tiger’s Glory is in fact a Roman-themed slot game from Quickspin. This super volatile game is played using a 6 reel, 4,096 ways to win game engine and comes with top design and a potentially explosive free spins round. Play on your PC, tablet or mobile from between 20p and £100 per spin. There are few better developers when it comes to design than Quickspin and the usual high standards are on display in Tiger’s Glory. With the mighty Coliseum in the background, the reels are set within a pair of marble columns. Symbols appear on blocks of stone. As well as lower value royal symbols, you’ll see a quartet of gladiators. The best paying symbol is the tiger which awards 1, 3, 5, 7.5 or 10 times your total stake if you land 2, 3, 4, 5 or 6 on adjacent reels. There’s also a wild that replaces everything apart from the scatter. The sword and shield scatter symbol triggers the Enraged Tiger’s Free Spins Bonus feature. Land 3, 4, 5 or 6 of them on the same spin and you’ll receive 7, 10, 15 or 20 free spins. As well as a standard tiger symbol, you could also see the enraged tiger during the feature. Whenever an enraged tiger hits, it will do battle with a gladiator. If the tiger wins, it remains locked in place for the rest of the feature. The first enraged tiger that wins a battle on each reel also adds another free spin to your total. This can result in 6 extra free spins with a possible 26 in total. Tiger symbols pay scatter style during the feature. Land a few sticky tigers and the coins can quickly build. You won’t find many better designed games that Tiger’s Glory. The visuals are superbly done and there’s a lush orchestral soundtrack playing as you spin. The gameplay is pretty straightforward. The best chances to land a biggie come in the Enraged Tiger’s Free Spins Bonus feature. Win the tiger battles, add extra free spins to your total and then let the sticky tiger symbols work their magic. The feature can be really hit or miss though. We pocketed virtually nothing on some occasions but filled our boots at other times. The variance here is very high so expect some big bankroll swings. You can however win a massive 13,830 times your stake on every free spin! This trip to ancient Rome is an entertaining one. It looks and sounds excellent and the feature offers plenty of potential. If you fancy some volatile Roman action, then Tiger’s Glory is well worth a closer look. I also suggest you take a look at other Quickspin titles with Dwarfs Gone Wild and Northern Sky two great options.